Illuminate a dull complexion with Yes To Grapefruit Bubbling Mask; a single use treatment for uneven, lack-lustre skin. 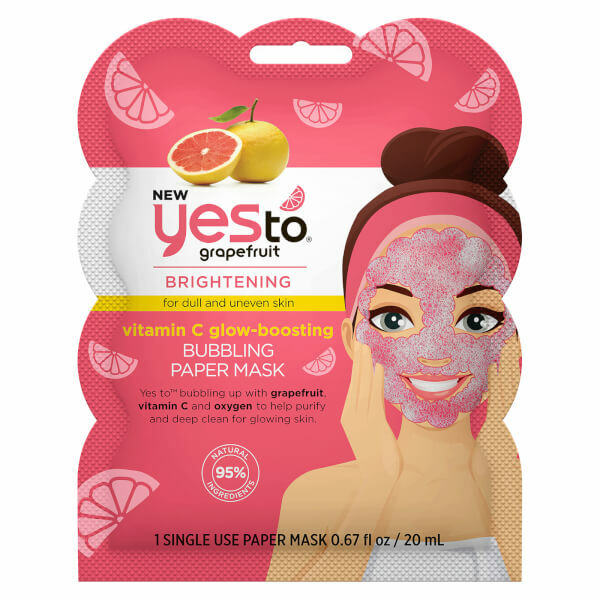 Utilising a radiance-renewing blend of Grapefruit and Vitamin C, the bubbling paper face mask activates upon contact with dry skin and delivers a deep pore-cleansing action; it draws out dirt and impurities, whilst reigniting a healthy glow in just 10 minutes. Gently unfold mask and apply to clean skin. Adjust around eyes, nose and mouth, smoothing to fit the curves of your face. Magically watch the bubbles appear. Close eyes and relax for 10 minutes. Remove mask and rinse.